SOUTH African anti-apartheid campaigner Winnie Madikizela-Mandela has died aged 81, her family have confirmed. The ex-wife of Nelson Mandela was known as “mother of the nation” and had been admitted to hospital in January with a kidney infection. News of her death comes on the day the US marks 50 years since the assassination of civil rights activist Martin Luther King — who her former husband paid tribute to while accepting the Nobel Peace Prize in 1993. The young activist met Nelson Mandela at a bus stop in Soweto when she was 22 in 1957 and the pair married a year later. Their romance lasted 38 years that was largely spent apart, with Nelson imprisoned for 27 years, leaving Winnie to raise two daughters and keep his political dream alive. In 1990 the world watched when Nelson Mandela finally walked out of prison — hand-in-hand with Winnie. But they separated just two years later and divorced in 1996 after a legal wrangle that revealed her affair with a young bodyguard and she went on to become embroiled in several major controversies. With or without Nelson, who died in 2013, Winnie built her own role as a tough, glamorous and outspoken black activist with a loyal grassroots following in the segregated townships. “From every situation I have found myself in, you can read the political heat in the country,” she said in a biography. 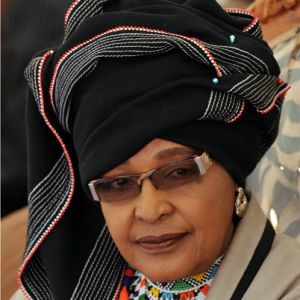 Winnie was born September 26, 1936, in the village of Mbongweni in what is now Eastern Cape. She completed university, a rarity for black women at the time, and became the first qualified social worker at Johannesburg’s Baragwanath Hospital. It was her political awakening, especially her research work in Alexandra township on infant mortality, which found 10 deaths in every 1,000 births. “I started to realise the abject poverty under which most people were forced to live, the appalling conditions created by the inequalities of the system,” she said. She wed Mandela in June 1958 but he soon went underground to escape authorities. In October that year, she was arrested for the first time at a protest by women against the pass system that restricted movements of black people in white-designated areas. After Nelson was sentenced to life in prison, Winnie was also in and out of jail as the police hounded her in a bid to demoralise him. Government security forces tortured her, tried locking her up, confined her to Johannesburg’s Soweto township, and then banished her to the desolate town of Brandfort, where her house was bombed twice. She was allowed to visit her husband in prison rarely, and they were always divided by a glass screen. Throughout the height of apartheid, Winnie remained at the forefront of the struggle, urging students in the Soweto uprising in 1976 to “fight to the bitter end”. But in the 1980s, the militant-martyr began to be seen as a liability for Mandela and the liberation movement. She had surrounded herself with a band of vigilante bodyguards called the Mandela United Football Club, who earned a terrifying reputation for violence. Winnie was widely linked to “necklacing”, when suspected traitors were burnt alive by a petrol-soaked car tyre being put over their head and set alight. In 1991, Winnie was convicted of kidnapping and assault over the killing of Stompie Moeketsi, a 14-year-old boy. Moeketsi, who was accused being an informer, was murdered by her bodyguards in 1989. Her jail sentence was reduced to a fine, and she denied involvement in any murders when she appeared before Archbishop Desmond Tutu at the Truth and Reconciliation Commission hearings. “She was a tremendous stalwart of our struggle, and icon of liberation — something went wrong, horribly, badly wrong,” Tutu said as damning testimony implicated her. She served as a deputy minister in President Mandela’s government, but was sacked for insubordination and eased out of the top ranks of the ruling party. She also called Tutu a “cretin” and the reconciliation process a “charade”, though she later claimed the quotes were never meant to be published. Despite it all, she was a regular visitor travelling from Soweto — where she still lived — to Mandela’s bedside in his final months, and she said she was present when he died. He did not leave her anything in his will. At her lavish 80th birthday party in Cape Town, Madikizela-Mandela wore a sparkling white dress and beamed with pleasure as she was lauded by guests that included senior politicians from rival parties. “Mama Winnie has lived a rich and eventful life, whose victories and setbacks have traced the progress of the struggle of our people for freedom,” then vice president Cyril Ramaphosa, who is now president. Winnie Madikizela-Mandela had been in and out of hospital since the start of the year, according to her family. It said it will release details of her memorial and funeral services when they are finalised.